To be really honest I think if the British BTL merchant came to Kichijo shi they'd do up the whole town and rent it out, standing the Japs upside down scratching theiir heads with a nice-ish quality cheap flat 30 mins from downtown Roppongi. The Japanese are quick to follow a trend though, so mind your back. Utter stupidity for prices of lux condos where the employer (bank) forks out the ex pat package. Bye bye that way of life. Hello crushing reality. Divorced or single forever cheapo apartments with pet have been the recent success stories. New on the block are 'shared houses'. A few juicy dramas doing the rounds too. This is basically a UK student arrangement as we know it. Have a bedroom share the bathroom and kitchen. There are plenty of houses now available for this and plenty of at last willing landlords who'll rent to any old bugger to get their cash injection fix. Why are the houses available? Because familys have broken to bits and they are simply unaffordable as rentable family units as they used to be. There used to be quite a code of conduct like marriage or something, now the landlords are happy to get what they can. In my book they are lucky indeed to be able to garner the same rent and should be happy to look away whilst their house goes the way of a multiple occupancy dwelling. Dig the new Tokyo. At least it is now affordable for the under waged. And that is the new trend. The real test will be the oil crisis. This is my take on the future. All the bigger towns and cities are gonna empty. They're gonna empty because the peolpe will be jobless and hungry. They're going to be starved of enough oil to make the life untenable. BUT before they empty out life liferafts on the Titanic, they are gonna fill up to the brim because there isn't any work in the countryside or the smaller towns. So people amass in the cities, taking their chances and doing whatever they have to do to get a wage whilst they still can. This is happening here, as I have pointed out. But with the future pressures pressing down on the future present people will have to beat a retreat (this is actually happening here too, to the slightly older than young). They move back to mom and pop, now gran and gramps. They farm or do low grade hospital work, supermarket stuff, part time, anything. They dig the veggie patch. They drive low tax 660cc cars. They average 1,000 US salaries/month. They have 2 kids. They don't know WTF has happened to/is happening to their lives. They are unaware of the larger social malaise and blame it all on the government or America or the 'fukeiki'-the bad business conditions. They run down their savings and their parents... Still they try to stick together if they have reason to. Often they split. The pressures are too great. When we get a better fix on future trends, I feel certain that we will be able to develop more optimistic scenarios. But we need to see the bad news clearly, before we can invent coping strategies. In the meantime, Downsizing, and Getting out of Debt seem sensible, since this will enhance future flexibility. I read a very good article about that phenomenon some time ago - perhaps it was her? This is why I find talk from Richard Koo and his ilk so alarming, when they talk of having 'rescued' Japan from a far worse depression. Now we're applying those proscriptions to the West! This attempt to postpone the Kondratieff cylce indefinitely is causing entrenched misery. The only saving grace is that we may implode more quickly and get it over with. It probably was her article, and I have now added a LINK in the posting above. and looking for a purpose beyond just buying and paying for a place to live. that it involves, lies at the very CORE of their identity (as adults). I'm not sure exactly how it will pan out for the UK tbh. I hope people there will see nominal falls. Otherwise they won't change their attitudes re property. The L line in Japan and the bubble which preceeded it has rendered many unable ever to be allowed to dream of owning. This is why Japanese LOVE their brand spanking cars. It is their Purchase of their lives. Think I better call Kunstler. He needs to do a show in Japan. Regarding Japan and the changes in society you can see here, you can see the truth in the Socionomics of Prechter on living in deflation. Or rather the effects a Deflation has on those living. In fact sometimes I wonder if his spies are not out here recording the changes and then reporting them back to HQ for the latest Socionomics monthly. This is one of the reasons I respect Prechter as a great thinker. Also his deflation for the west theory is yet to be judged IMO. ...Think I better call Kunstler. He needs to do a show in Japan. You might even get Duncan Crary to use JAPAN as a focus for a future KunstlerCast. I just started a thread there on our "Agrarian Future", and may have coined the phrase "Kunstler Wave". Let's see if it catches on... Only 15 hits as of today. You know. I think Jim would burst a few blood vessels here in Japan. What are we? A country about as big as California, 70% uninhabitable mountains, with half of the US population, 99% dependant on imported oil to run our cars. Not only that but this country had the arch impudence to usurp the US as car making culture of the world! It's all so beautifully unsustainable it makes me stretch for the sake at times. To top it off the architecture of the cities would leave him in a coma. The Japanese love to drive to the malls and even the towns are built with the car at the forefront of the mind. The Japanese hate weather or walking for anything. Even mountain wildernesses have vending macines parked on top so one can have a hot can of coffee. What hubris! I dread to think of his expletives. Still I confess it would be good food for a podcast or 2. And Duncan would love it, I am sure. Perhaps I could invite them? The good side would be listening to Jim wax lyrical on all the good things Japanese. The 'lost' things that will re-emerge with the dawn of realization as oil runs out. The forests, the water, the food, the simplicity of life in the country and her nature inspired architecture. Hi Bubb. I was chatting to an old friend of my wife's yesterday who just happens to now be an estate agent. He told me he started his small business 4 years ago and was doing quite well now. He was astounded by my many questions and said most Japanese people don't even consider some of my questions as they are blissfully unaware of the market and the last 20 years. Anyway to cut it short he said the bottom was about 18mths ago. And his business has picked up since then. He said rather than prices taking off again, simply it is a market driven by the next generation of untraumatised buyers (with good jobs) who have a bit of a deposit saved up and usually all take on the non fixed mortgage options available, usually fixing for 2,3,5 years. He said people see no hints of rising rates for some time yet. He also said how badly damaged the generation above had become. Many lost everything and will remain tenants for the rest of their lives. That or just content to sit underwater on their remaining 35 year loans. Many of these are the older suiciders, the truly 'lost generation'. He stressed the reason people buy condominiums and 'mansions' despite them being instant depreciating assets is that of a cultural thing mainly ie Japanese are always attracted to the latest offering be it car, stereo or apartment complex. Recently he said, this is showing signs of changing (Kichijo shi??) and some savvy younger are attracted to doing up the older apts/cheap houses. It is really the LAND only which is of any value and still this is WAY too high to be affordable to most esp in the big cities. Rents are the same as mortgages for many new build, so if you know you are going to stay and wont be selling, people are being encouraged to buy. Housing costs have become very cheap, he said, with all the newer materials and the kit houses which the big builders cleverly arrange. These places start at about 80,000 US and average at about 150,000-170 depending on your many options. Have to run.. very interesting stuff and you can summise a lot. I said these people buying were 'brave' and he gave me a long, thoughtful stare, but we didn't have time to go there. 'Maybe', at last was his reply. Thats all I got and a typical Japanese answer to anything non comittal. This would add to Catflaps K spring for Japan theory. But I dont think the volume will be as great as normal. Perhaps a mild spring. The 'echo boomers' giving impetus for this is greatly reduced and will be short lived, esp post 2020. Japan has lots of other problems to work through, as we all know. Still it only seems fair to present the facts as I heard them. Rates could turn up here soon and the government has talked about tring to follow a 2% inflation course recently. How this all pans out, nobody knows. If I was buying on a mortgage here I would likely pay more for the fixed rate. But that's just me, super cautious. I also hate the new builds (ersatz plastic grey/buff boxes, devoid of character). Their only good points are the solar panels which are standard and the other genuine energy saving wotnots and hopefully genuine improved earthquake proof standards. I'm gonna bung this here too, just in off the news. ..lack of liquidity..?? More QE for Japan? I think Kan has totally the wrong idea but he's in charge, not me. While stressing the need for fiscal discipline, Kan challenges the policies of Koizumi and his guru, Heizo Takenaka, saying their Western-style free competition and deregulation approach did not work. Kan is also expected to go after deflation. As deputy prime minister, he was the one who declared last November that Japan was in a state of deflation, and the main culprit was a lack of liquidity. "People and companies want to save money instead of purchasing and investing" in Japan, Kan said at a press conference on May 28. He has pressured the Bank of Japan to adopt more aggressive monetary policies, and financial markets are watching to see if he will seek further monetary easing by the central bank. The market is also focused on Kan's currency stance, as he is known to favor a weaker yen. During his inaugural press conference as finance minister, he made clear he did not favor an excessively strong yen. Since then, he has made similar remarks several times, saying he is echoing the voices of the Japanese business community. While uncertainties remain regarding the new government's economic and fiscal policies — a new finance minister has yet to be named — some economists say Kan so far seems to be on the right track. Hideki Matsumura, senior economist at Japan Research Institute Ltd., said Kan will probably confront fiscal reconstruction and deflation issues harder than Hatoyama. He said the Hatoyama Cabinet was persistent in trying to realize the party's Lower House election campaign pledges, which resulted in drafting the massive 2010 fiscal budget with huge government debts. "Rather than strictly following the election campaign pledges, Kan seems to be making remarks based on the realities. I don't think his basic direction is wrong," Matsumura said. He added Kan's vision remains unclear, but he is determined to fight deflation, which is the most pressing economic issue facing the nation. "It's like Japan's economy has a huge hole, and if the hole is not fixed, (the economy) will be stuck no matter how much domestic demand is stimulated," he said. Good programme on now about Tokyo property (flats or Mansions as they are called here). Prices are cheaper than 2 years ago. 10-20%. Supply of new flats has halved since 2008. Rise in interest in 'compact' mansions. 40-m2- 57.17m2. Single females are main buyers. Men, and older retired singles next. Get the picture? The are desperate to get spending in this sector going. (Tokyo only-other areas like even OSAKA are dodo's). Lehmann was continually mentioned and charts after the 'shock' of this isolated event and the effect it had on Tokyo condos. I still wouldn't go anywhere near Tokyo and I suspect this so called 'bottom' will be revisited. Maybe that was the long stare after I said these buyers are brave buying in the precarious state the world and Japan is in. Incidentally many richer Chinese buying areas of Tokyo. ...Anyway to cut it short he said the bottom was about 18mths ago. And his business has picked up since then. He said rather than prices taking off again, simply it is a market driven by the next generation of untraumatised buyers (with good jobs) who have a bit of a deposit saved up and usually all take on the non fixed mortgage options available, usually fixing for 2,3,5 years. He said people see no hints of rising rates for some time yet. 18 months ago? That is: late 2008? I wonder if that bounce was part of the global flood into property from QE - from all the central banks? If so, it may be ending now. Certainly, we are seeing a slowdown now for property in the UK and in HK. The Japanese property shares are warning that another slowdown may be ahead, and it should be visible in 2H-2010. EA's and the average buyer are not good forecasters of rate rises, but property shares are. There's a guy in HK (Chris Dillon) who has written a book on Japanese property, and he recommends small 2nd-hand flats, of about 200sf in Central Tokyo. This sounds right to me, but I want to get hold of his book, and understand his argument better. Have you a link to a site with charts of Japanese interest rates? Not much sign of that "low 18 months ago" - that must be in newbuild prices - an area to avoid. Perhaps the mainland Chinese money has flooded into the newbuilds - they seem to prefer those, even if they overpay. Japan keibai bukken (Japan foreclosures). We facilitate the purchase of auctioned real estate in Japan and can assist with every aspect of your property investment. That kitty in the bottom right corner, has she been foreclosed on too? "Landed is an essential reference for anyone buying real estate in Japan. It is unbiased and full of practical, up-to-date information. Even Japanese buyers can learn a lot from this book." ----Nobuo Takenaka, President and CEO, Misawa Homes Co., Ltd.
Landed: The guide to buying property in Japan is a resource for anyone purchasing or thinking of purchasing real estate in Japan. Whether you're looking for a family home, a ski chalet or an investment property, Landed will save you time, money and effort. 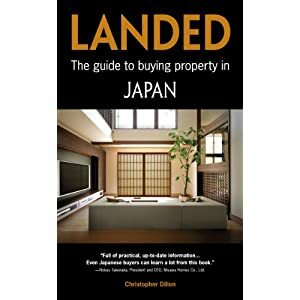 In Landed you'll learn: How property is bought and sold in Japan. Where to find financing, legal advice and other essential services. How to recognize and manage Japan-specific risks. Where to find property listings (even if you can't read Japanese). How aging and migration are reshaping Japan's property market. Where not to buy. How to check a real estate agent's credentials. How to get tax breaks and other incentives. About the opportunities and risks in recreational and repossessed property. How residents and nonresidents have successfully bought property in Tokyo and beyond. I hope to meet Chris in about two weeks. I can see you have been busy. Looks like a good book and fascinating you will meet the author. Would be glad of anything you could glean and post here. 2 beers with Steve has a great podcast with Erik Townsend, now living in HK. Perhaps you already know him? Great input on China and economy talk. HK reverts to China proper in 2047? And you have a property bubble there now? With the future looking as it is, might it not be a great time to cash in ones chips? Meant to mention the foreclosure sites, but that one is a first...will be looking at that later. I look there for land. Soooo cheap you'd die. Interesting he said about second hand flats. I would go there. The younger Japanese are changing and becoming a bit more 'wayward'/adventurous. These trends are everywhere. And that is reinforced by the seeming end to 'life as we know it' Japanese conservatism, small c. The old ways are dying if not dead. With the new come affordable dreams and attitudes. With all these things considered it might be time to consider Japanese property investment soon. I think there is a bit more pain yet to come though. And I would recommend some good inside advice as the Japanese are terribly fickle and fashions quickly go out of fashion here. Book looks a damn good read. Is it REALLY 94 bucks?? I havent met Eric T., but I have heard an earlier interview. It just occurred to me that he must be the same "Eric from HK" who calls into Financial Sense. I should arrange to meet him sometime. I have sold 8 of my 10 flats here, and so de-risked my portfolio. Yes, the book is really $94. Maybe I can get a special price - on a two book, or three book basis. Just peeked at that foreclosed site. Some places there are more than a steal.Its nice to see all the info in English too. Usually the foreclosed sites are laborious to work through. This though would be your ticket to cheap apts in/near Tokyo. Listened to Erik on 2BwithS, yet? He sounds just up your street and he does post on FS from time to time. Long podcast though very enjoyable. Listened to Erik on 2BwithS, yet? He sounds just up your street and he does post on FS from time to time. Long podcast though very enjoyable. Chris is willing to give us a discount on the book.